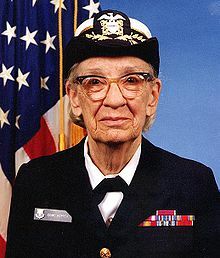 The rear admiral Grace Murray Hopper (born with the name of Grace Brewster Murray in New York City on the 9th of December 1006 – d. The 1st of January 1992), the first of the three children of the family, was a pioneer in computer science, and an officer in the military marine of the United States of America during the Second World War. Grace Murray Hopper was among the first programmers of the Harvard Mark I computer, and she developed the first compiler for programming language which was the precursor of COBOL language. Grace Murray Hopper took the passion for mathematics from her mother, Maria Van Horne. Both her mother and her father, Walter Murray (insurance broker), considered that their daughters must receive the same quality education as their brother. Grace Hopper studied mathematics and physics at Vassar College, and graduated in 1928, whereupon in 1930 received a master degree in mathematics at Yale University. The same year she married Vincent Foster Hopper, name she kept even after their divorce in 1945. In 1931, Grace Hopper started to teach at Vassar College, but continued to study at Yale, where she obtained a PhD in mathematics in 1934, becoming the first woman who ever received such a title. After the war, Grace Hopper remained in the Marine as a reserve officer, but she was also researcher at Harvard where she worked with the computer Mark II and Mark III. She was present at Harvard in the moment when there was proved that a moth has supposedly short-circuited Mark II. Although Grace Hopper is not the inventor if the phrase “computer bug”, she popularised it very much. In 1949, wanting to continue working with computers, Grace Hopper moved in the private sector, at the beginning along with those from Eckert-Mauchly Computer Corporation, then with Remington Rand, where she supervised the programming for the computer UNIVAC. In 1952, Grace Hooper and her team created the first compiler for programming languages which was the precursor for COBOL – Common Business Oriented Language. Grace Hopper retook her activity in the Navy at the age of 60, becoming admiral in 1986, before her retirement. She dedicated her entire life to serving the country she very much loved. Grace Hopper died on the 1st of January 1992, and was buried on the 7th of January with military honours at the Arlington National Cemetery. The legacy that Grace Hopper left behind encourages the youngsters to learn programming. The Grace Hooper Celebration of Women in Computing Conference is a technical conference which encourages women to become a part of the computing world, made with the help of the Ana Borg Institute, while Computing Machinery offers the Grace Murray Hopper Award. In 2013, Grace Hopper was commemorated on her birthday with a Google Doodle.